Detective Rowan Black works robbery/homicide for the Portsmouth PD, but her greatest mystery is the truth about herself...both who she has been, and who she will become. Yet there are others in Rowans world with very long memories, and the power that one person holds, another will always covet. 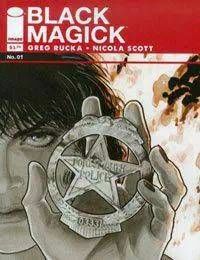 PLUS, each issue also features an all-new work of original fiction by GREG RUCKA! A new gothic-noir ongoing series about legacy, destiny, redemption... and the price of magic.